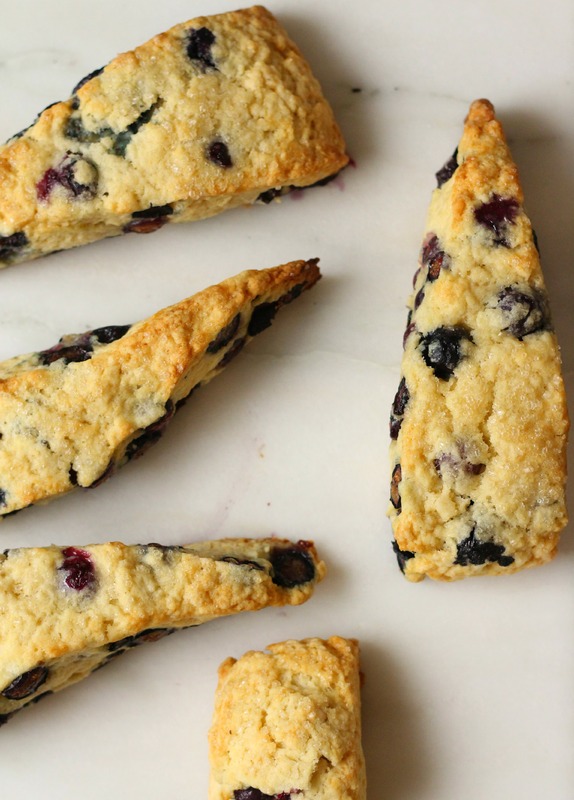 July is national blueberry month, so I’m celebrating accordingly, with this incredible scone recipe. Blueberries are one fruit that I almost always prefer to eat fresh. I love their bright, juicy tartness, and somehow, they don’t always seem to retain that fresh flavor when baked. But this scone is different. Rather than being lost in a flurry of sugar and lemon juice, the berries are left natural, untouched. When baked, they become like little blue jewels; beautiful, dripping with fresh berry juice, and still bursting with the same flavor that I love. And the scones are perfect, too. Flaky, crumbly and faintly reminiscent of cream, these are, beyond a doubt, the perfect indulgence to start your day with. Why I love this recipe: freezing and then grating the butter ensures that the scones will be flaky and buttery, and folding the dough like puff-pastry creates beautiful layers. The berries are left natural, so the blueberry flavor is clear, and the berries burst and become deliciously jammy. Heat oven to 425 degrees. Remove half of wrapper from each stick of frozen butter. Grate butter and place grated butter in freezer until needed. Melt 2 tablespoons of remaining ungrated butter and set aside. Save remaining 6 tablespoons butter for another use. Place blueberries in freezer until needed. Whisk together milk and sour cream in bowl; refrigerate until needed. Whisk flour, 1/2 cup sugar, baking powder, baking soda, and salt in medium bowl. Add frozen butter to flour mixture and toss with fingers until thoroughly coated. Add milk mixture to flour mixture; fold with spatula until just combined. With spatula, transfer dough to liberally floured work surface. Dust surface of dough with flour; with floured hands, knead dough 6-8 times, until it holds together in ragged ball, adding flour as needed. Roll dough into approximate 12-inch square. Fold dough into thirds like a business letter, using bench scraper to release dough if it sticks to countertop. Lift short ends of dough and fold into thirds again to form approximate 4-inch square. Transfer dough to floured plate and chill in freezer 5 minutes. Transfer dough to work surface and roll into approximate 12-inch square again. Sprinkle blueberries evenly over surface of dough, then press down so they are slightly embedded in dough. Using bench scraper or thin metal spatula, loosen dough from work surface. Roll dough, pressing to form tight log. Lay seam-side down and press log into 12 by 4-inch rectangle. Using sharp, floured knife, cut rectangle crosswise into 4 equal rectangles. Cut each rectangle diagonally to form 2 triangles and transfer to parchment-lined baking sheet. Brush tops with melted butter and sprinkle with sugar. Bake until tops and bottoms are golden brown, 18 to 25 minutes. Transfer to wire rack and let cool 10 minutes before serving. 07 Jul	This entry was published on July 7, 2014 at 8:07 pm. It’s filed under Delectables and tagged blueberries, blueberry scones, breakfast, brunch, delicious, food, fruit, july, photography, recipes, scones, summer, writing. Bookmark the permalink. Follow any comments here with the RSS feed for this post. I love these. I make a version of this almost every weekend. I usually substitute the sour cream with greek yogurt. Soooo yummy! Well done. I actually do that too! I find Greek yogurt and sour cream to be practically interchangeable, so I’ll use whatever I have on hand. Thanks! These look so delicious! Yum!! Thanks! They were, I had way too many!